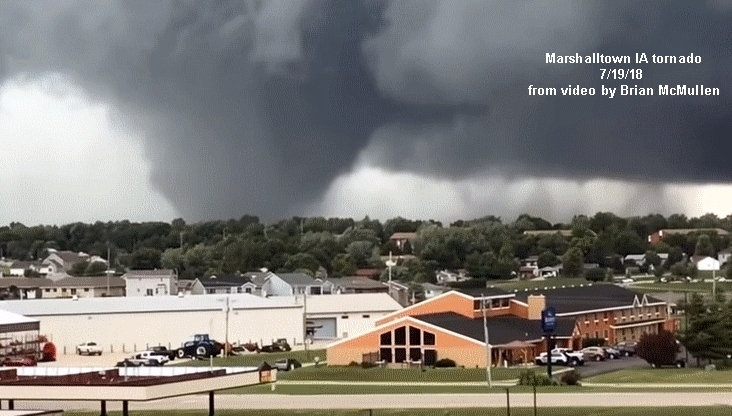 Thursday's biggest weather news wasn't tornadoes. The tour boat sinking from strong thunderstorm winds at Table Rock Lake near Branson in southwest Missouri was a deeply sad tragedy that killed 17 people. Much has been written online about this event, which was likely preventable if the tour company had called in all boats on the lake immediately after a severe thunderstorm warning was issued at 6:23 PM CDT, roughly 30 minutes before the sinking. The issues involved are similar to those raised by a deadly outdoor concert stage collape in Indiana back in August 2011 (see my archived article here). However, this post is a look at the meteorological setting that produced tornadoes in Iowa on 7/19/18..
Thursday's tornadoes in central Iowa were another 2018 "surprise" of sorts. Morning forecast outlooks (not shown) had a 2% or less chance of tornadoes over central and eastern Iowa, and a tornado watch wasn't issued until after the first tornadoes were on the ground doing damage. 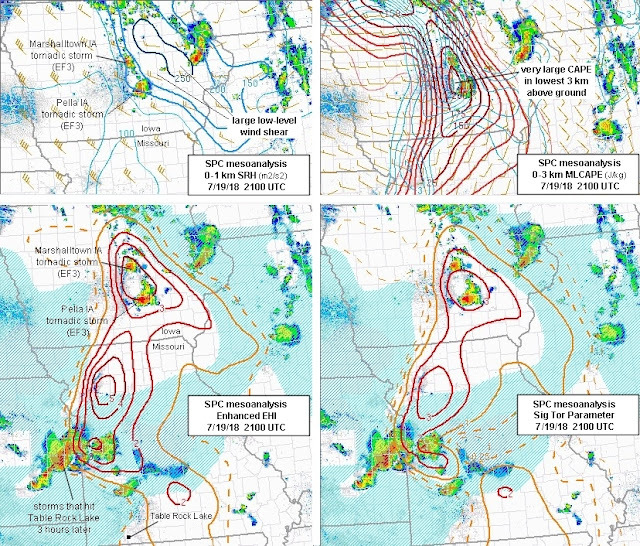 But, after the watch was in effect, tornado warnings continued to be issued, including for the strongest tornadoes (EF3) at Marshalltown and Pella (see images above) around and after 2100 UTC (4 pm CDT). Thankfully, there were no fatalities. Notice that on all three days (July 18 through 20), tornadoes occurred near the surface warm front southeast of the closed low aloft, with Thursday 7/19/18 the biggest day (a local "outbreak"). Looking more specifically at environmental ingredients on 7/19/18, the mid-morning HRRR model run forecast large storm-relative helicity (SRH, or low-level wind shear) for the afternoon over central Iowa along and northeast of the surface warm front where winds were backed and coming from a more easterly direction. This was co-located with a gradient of increasing instability (CAPE, or convective available potential energy) along the warm front, making for good combinations of instability (CAPE) and low-level wind shear (SRH) to promote storm rotation along and just northeast of the surface warm front (see red ellipses on the HRRR forecast graphics below, valid at 1900 UTC (2 pm CDT). As it turned out, thunderstorms began to form over central Iowa shortly after 1900 UTC, two to three hours earlier than forecast by the HRRR model. A cell east of Des Moines rapidly became a supercell, and produced several tornadoes, including a couple at the same time. An EF2 tornado near Bondurant occurred already by 2000 UTC (3 pm CDT, not shown). At 2100 UTC (4 pm CDT), real-time SPC mesoanalysis graphics (below) confirmed the large SRH and low-level wind shear over the eastern half of Iowa. Instability in low-levels closest to the ground (below 3 km) was also unusually large in central Iowa (see the upper right panel of the graphic below) near the warm front. This was due to the colder air ("cold-core") aloft around 700 mb moving southeast above surface air with dew points in the 70s deg F, which is extremely moist for a cold-core type event. 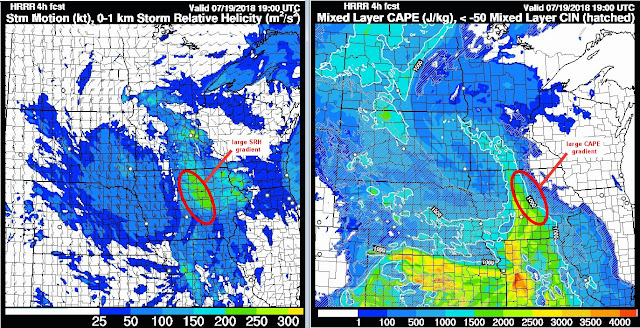 The lower left panel above shows an enhanced version of the energy-helicity index (EHI) that I've developed, combining CAPE, SRH, deep-layer shear, and low-level CAPE, ingredients important for supporting supercell tornadoes. This was at 2100 UTC, about the time of the Pella tornado (southernmost supercell in Iowa), and shortly before the Marshalltown tornado (next supercell to the north). Notice how this parameter was maximized directly in the area where the two tornadic supercells were moving east or east-southeastward. The SPC significant tornado parameter at 2100 UTC (lower right panel above) showed a similar pattern. So, analyses and model forecasts from mid-morning on, if studied carefully, did seem to suggest an environment conducive to possible supercells and tornadoes over the eastern half of Iowa, even though they were too slow on the initiation of storms. These ingredients, combined with the presence of an advancing closed 700 mb low disturbance from the northwest, and a surface warm front, appeared to optimize the setting for tornadoes over the eastern half of Iowa. 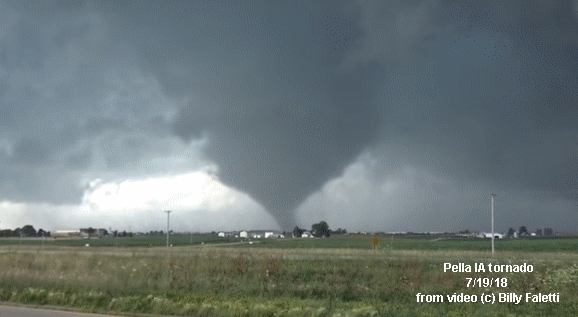 Cold-core type settings can produce tornadoes rapidly when the ingredients come together right, and that was the case here. The tornadoes near Bondurant, IA (east-northeast of Des Moines) around 2000 UTC (3 pm CDT) developed only 30 to 45 minutes after this cell was visible on radar. Part of this rapid development may have been due to the large low-level CAPE near the ground (refer back to the upper right hand panel of the 4-panel SPC mesoanalysis graphic earlier). The large 0-1 km SRH co-located with this strong low-level instability may have facilitated low-level storm updraft stretching and vertical tilting of horizontal wind shear (SRH) to help generate tornadoes within a relatively short time. My wife Shawna mentioned the presence of what appeared to be a closed low aloft from satellite and radar loops on TV on the morning of 7/19/18. But we were packing and shutting down her mother's apartment that day (Shawna's mom recently moved to a nursing home), so I didn't give it much thought. It's important to remember that closed lows with their cold air aloft and tight, strong dynamics can sometimes result in "surprises" if one isn't paying attention. In addition to the tornadoes, the Table Rock Lake tragedy on 7/19/18 was a stunning reminder that thunderstorm winds can be as deadly as tornadoes. What a sad day.